It has his autograph signed directly on card and looks to be in near mint to mint condition. All photos displayed are of the actual card for sale. I am not a professional grader. 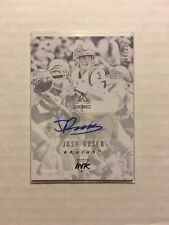 JOSH ROSEN UCLA BRUINS 2018 PANINI LUMINANCE ROOKIE INK RC AUTO 088/125 ! 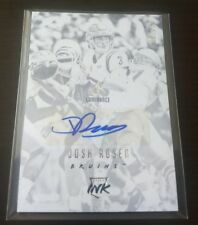 You are buying the 2018 Panini Luminance ROOKIE INK AUTO of Josh Rosen, card number RI-JOR, SERIALLY NUMBERED 088/125 ! This card is in great condition. 2019 Contenders Draft Picks CALEB WILSON College Ticket #163 AUTO UCLA. THIS YEARS SET HAS AUTOGRAPHED GEMSTONE CARDS THESE ARE GONNA GO CRAZY! FACTORY SEALED FROM FLAWLESS! SERIOUS INQUIRIES ONLY! 2018 PANINI ELITE DRAFT PICKS NFL. #102 JOSH ROSEN. ASPIRATIONS RED PARALLEL. ROOKIE AUTOGRAPH CARD. I also try to be fully transparent & describe any imperfections. Item as Described?. Communication?. Think of it as a mutually beneficial trade! I will always do my best to work with you on a solution. SET CARD 145. SERIAL NUMBERED# 3 / 5. SUPER THICK CARD! SEALED AND ENCASED WITH STICKER SEAL. JOSH ROSEN 2017 PANINI - INSTANT FOOTBALL. PANINI NFL COMBINE EXCLUSIVE. GREEN PARALLEL. THIS CARD IS IN NM-MT CONDITION OR BETTER. This card has been personally autographed by the athlete. 2019 Panini Contenders.